Kiddy Up With Horses participated at the 7th Annual Farm Fest at the Equestrian Center on October 29, 2016. 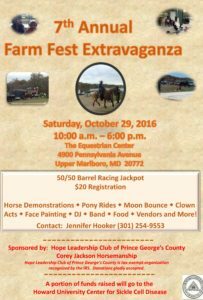 Kiddy Up With Horses participated at this year’s “Farm Fest” at the Equestrian Center in Upper Marlboro Maryland. There was lots of fun for the kids. Kiddy Up With Horses provided pony rides for waiting children. Angel and Grace were the ponies brought for this occasion. Angel is a 14.9 hand horse and Grace is a large pony 13.8. The children who rode the ponies were ranging from ages of 3 to 12. Grace was brought for the smaller children. Surprisingly, the smaller children were fascinated with Angel the horse and wanted to ride her rather than the large pony. I heard quotes like “This is so awesome” and “This is the most fun I have ever had”. Children do not lie and they love expressing their true feelings. Today’s activities made me and the Kiddy Up With Horses Board Members know that we are on the right track for empowering youth through horses.